Over the weekend U.S. troops installed added concertina wire on portions of the southern Arizona border wall near Nogales. TUCSON, Ariz. - Over the weekend U.S. troops installed added concertina wire on portions of the southern Arizona border wall near Nogales. Nogales Mayor Arturo Garino told KGUN9 he first learned of the added wire going up over the weekend. 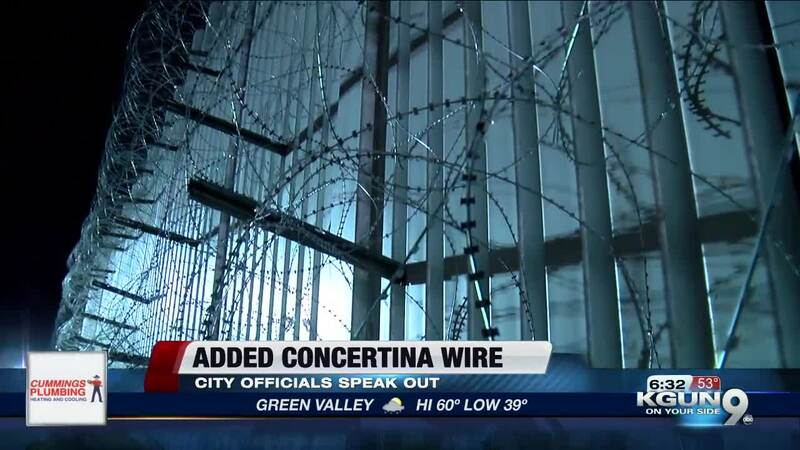 "Concertina wire is not safe, it's a lethal wire. It's not barbed wire. But it was on top of the fence and you could probably live with it," Mayor Garino said. On Monday, Feb 4 Mayor Garino said he met with staff to talk about their concern over the added wire and the danger they feel it poses. "Everything comes through our ports here. This port is very important. This port should not have that wire on there not around our ports where they do legal activity not illegal activity, legal activity. We do not condone illegal activity," Mayor Garino said. KGUN9 reached out to U.S. Customs and Border Protection who sent us a statement which read the following.